Many people are talking about P-list damage or talk about SA damage and believe if either one of them is damaged, the data is gone. This is not true at all. 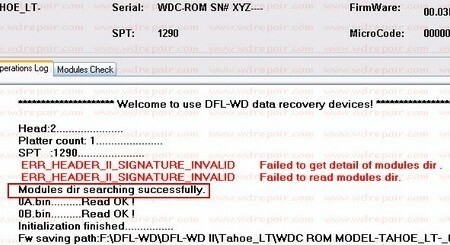 Data Recovery is always possible when the p-list is damaged or when there’re SA damage. We must be clear about one fact: SA area and user area(data area) are two different areas, they act very similarly like system partition and other partitions. For example, if the partition C is system partition and partition D, E, F contains the data users put. Now partition C-the system partition is damaged, the data is still in Partition D, E and F.
It’s the same idea about the SA and data area. 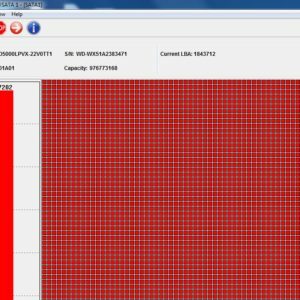 This article is mainly talk about the p-list damage and possibility of recovering the data. 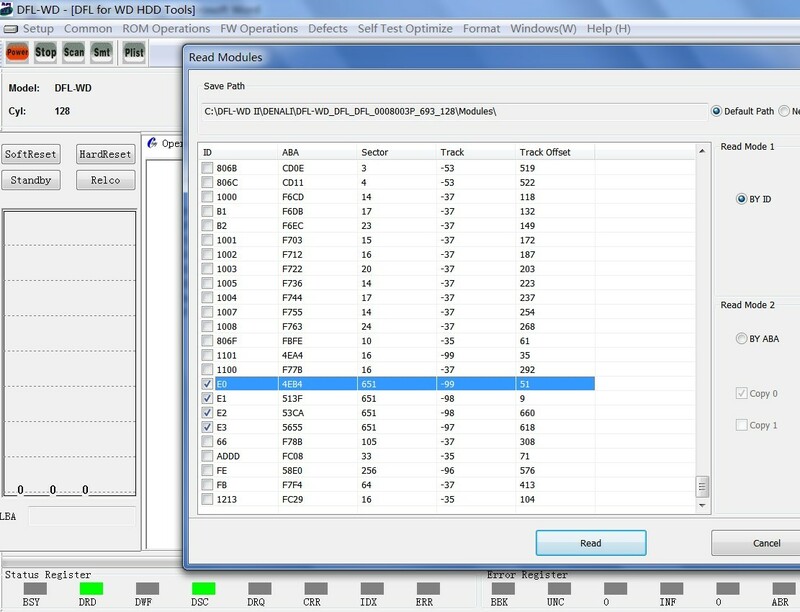 With DFL-WDII hdd repair tool, users can regenerate the P-list in two different methods. P-list regeneration is used when the original P-list is damaged and the sectors cannot be read at all. P-list Translator and P-list are closely connected. To regenerate translator requires original P-list. If the P-list is damaged but the translator is good, then clients don’t need to regenerate the plist to recover the data. To regenerate p-list, users need to read the modules E0, E1, E2, E3, E4, EX and it depends on how many heads the hdd has., for example, the hdd has 4 heads, then you just need to read the E0 E1 E2 E3 and then go to menu Defects>P-list>Regenerate P-list. Click the tab ‘Modules Check’ and select module E6, right click and click ‘Clear Current Module’. Tick the 00D2 Process only, change the next TestID value to 32, ID =32 means the DC process which refers to Stop selfscan. NEXT TESTID value must must be the DC process, otherwise, there will be problems after running the selfscan, if it runs B9 Process, all your data will be wiped , so you need to be very careful on this operation. After changing the value and then you can run selfscan now to regenerate P-list by running 00D2 process. 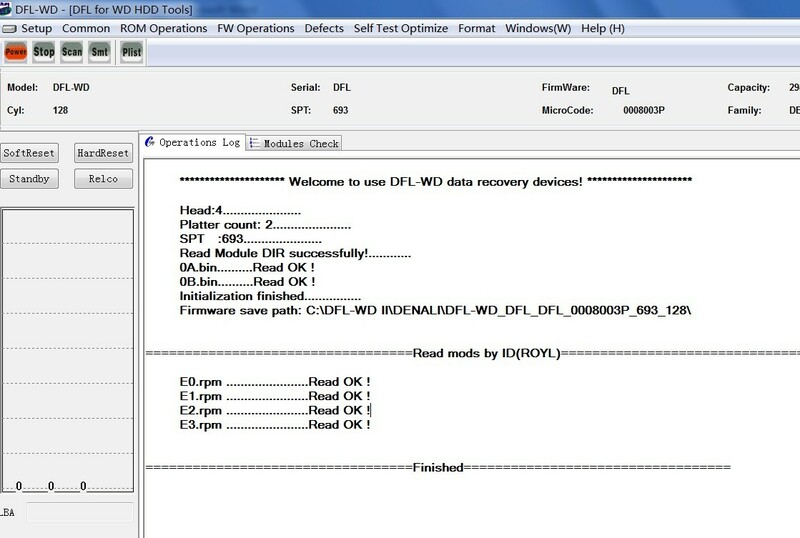 Users can login our user-only forums to read more detailed technical documents and DFL-WDII hdd repair tool offers users with a much higher success rate of WD hdd repair. 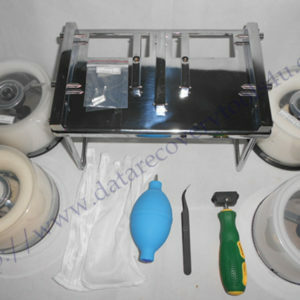 Clients can view more details or order directly DFL-WDII hdd repair tool by our online shopping system here.